It’s been that time of year again – when hoards of classicists descend upon the Cambridge Arts Theatre to see whatever is being presented as the triennial offering of the Greek Play. Since I wrote about the 2013 play, the Greek Play website has been given a revamp to include a lot of material from the Greek Play archives, all the way back to the performance of the Ajax in 1882. I should also note that the first production to include more than one woman seems to have been the 1950 Oedipus at Colonus, which is really quite late if you think about it, particularly since Bedford College had been putting an all-female Greek play (starting with Iphigenia in Tauris) since 1887. The single outlier was Janet Case, who played Athena in the 1885 Eumenides, but no other women appeared on stage until the 1950 production. But I digress. This year’s offering followed the format of the 2013 production by bookending a tragedy and a comedy; my thoughts on gender come a little from the choice to stage Antigone and Lysistrata, plays which both revolve around female protagonists. The pairing of tragedy-comedy is meant to try and capture something of the spirit of the Great Dionysia, where the audience would be given the blessed relief of a satyr play after a thematically linked sequence of three tragedies. I have to say that there is something to this, the idea that after being plunged into gloom, the responsible dramatist pushes down hard on the other side of the seesaw. There’s also something very rich in the demands made of actors shifting between modes so quickly, and it allows the comedy to make jokes using the audience’s knowledge of what happened in the tragedy. Helen Eastman, the director of the Greek Play since 2010, has spoken about the improv/workshop approach she takes in the seven weeks before the performances, which allows the plays to develop organically and in dialogue with each other. This relatively short window is particularly important for the comedy, which needs to keep pace with current events; I think the team deserve a small round of applause for managing to keep on top of political developments over those seven weeks without completely loosing the will to live at the number of rewrites they must have needed. The National Theatre’s new production of Medea has been getting positive reviews, including a considerable spread in the Evening Standard (although I think the comment about Creon being under-used misses the point of how Greek tragedy works). The script is a new version by Ben Power – unfortunately there doesn’t seem to be much out there about how he’s worked with the text, although he’s doing a Platform talk on the process that I’m going to try to get to. It’s not entirely faithful to the original Greek – the nurse becomes conflated with the pedagogue and says a closing epilogue, for instance – but after teaching the play in the autumn , I could hear plenty of echoes of the original Greek in there. The language is powerful and imaginative, although quite terse and quickly paced, and keeps ancient elements like calling on the gods without trying to modernise them. The production has an interesting approach to music – it is accompanied by new compositions from Goldfrapp, which manage to be compelling and eerie at the same time. The chorus actually sing their choral interludes, which is rather wonderful and very effective; they also dance, although I have to say that while I can see the spasmodic choreography as mirroring the emotional and psychological convulsions of the plot, it was a bit difficult to take it entirely seriously. The dance of the princess as she tried to remove the poisoned dress worked much better from that perspective. I think the musical soundtrack was one of the strongest elements of the production – it underlays everything, very much like a film score (I shall come back to that point), and so intertwines in the audience’s consciousness to very strong effect. It’s a very subtle score, enhancing emotional response without dictating it too obviously; I noticed it with a jolt in the closing scenes, not because it did anything differently, but because my brain suddenly noticed it was there! This might have more to do with my immersive attitude to theatre-going, but I can’t remember a recent production that’s handled its music this well that hasn’t been musical theatre or opera. The chorus themselves wear dresses covered in a shabby-chic floral print that echo the woods which are presented at the back of the stage (hypothetically ‘outside’ the house in which the action takes place); it’s not until the end of the play that it becomes clear that the patterns of flowers on their dresses echo the bloodstains on Medea’s dress after she has murdered her children. The handling of the chorus is one of those particularly difficult challenges for modern productions; here, the director has them fade on and off stage, meaning they can be read either as ‘real’ characters or as figments of Medea’s imagination, which was a convincing approach. They also made good use of a boxed-off room at mezzanine level, in which the wedding of Jason and Creusa was played out – that let the audience see the progress of the party (and Creusa’s eventual death-dance) without detracting from the action in the ‘main’ house. I’ve been pondering the Cambridge Greek Play since seeing it last Saturday at the matinee performance. I’m not entirely sure how we ended up with tickets in the very front row – I think it had something to do with booking as soon as tickets were available – but there we were, ensconced for a double bill of Aeschylus’ Prometheus and Aristophanes’ The Frogs. I’ve been trying to work out what I thought of it ever since. I mean that in a good way. The history of the Cambridge Greek play goes back to 1882, when the first play in Greek was performed, fuelled by an interest in ‘authentic performance’, costumes and sets – the photographs are wondrous to behold. The play is performed every three years, and although special trains are no longer laid on to get the keen audiences up from town, the theatre is still packed out (translations are now provided by surtitles). There is a healthy tradition of performing Greek plays in the UK – Kings will be staging Aristophanes’ Wasps in February, and in historical parallels I recently saw an fantastic archive photo of the women of Bedford College in the late nineteenth century togged up in togas and false beards for one of their productions. It’s a pleasure to see that the Cambridge contribution is not only maintained, but well attended. Well attended, I should add, not only by those of us who might be considered under professional obligations as academic staff, teachers, graduates, undergraduates and school pupils, but by members of the general public. These audience members may have done a bit of Latin and Greek themselves at school, or may have simply come along because the play was listed in the Cambridge Arts offerings for the month and they fancied seeing what it was all about. So the producers and cast of this play have a tricky brief to fulfil – they have to make sure that the results of their labours appeals to these often divergent audiences. I have a bit of a love-hate relationship with Sophocles’ Antigone. I didn’t have much to do with it as an undergrad – as far as I can remember, I spent more time with Euripides’ Hippolytus, Sophocles’ Electra and the Oresteia trilogy. Neither did it form a central element of my graduate training, although of course I read it for my comprehensive exams. But I came to wince whenever a student mentioned that they had read the Antigone in high school. In my admittedly limited experience, it inevitably meant that they had been taught it badly, at least as far as a classicist was concerned, in ways that prioritised presentist readings over appreciation for the ancient context. This isn’t to say that the Antigone can’t still speak. In fact, the language, imagery and themes of the play remain strikingly powerful and relevant, as the current production at the National Theatre demonstrates. You have probably heard of it as the one with Christopher Eccleston as Creon, thus following David Tennant in bringing legions of Doctor Who fans to more traditional theatre, but the play itself is marvellous. 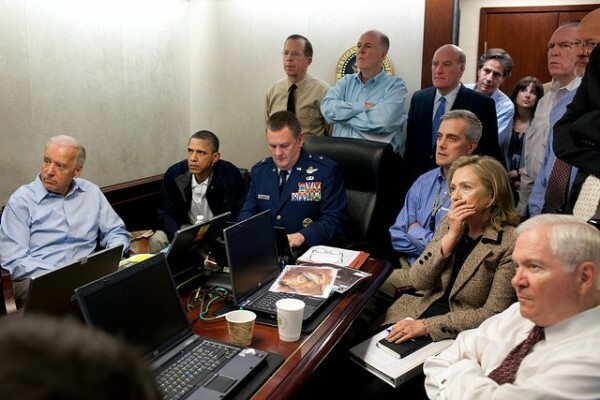 It begins with a recreation of the famous White House situation room photograph released when the death of Osama bin Laden was announced. The question of how to treat the dead was, of course, critical to that incident as well, given the decision to bury bin Laden’s body at sea. The set is evocative of some administrative space in the Iraq Green Zone, all temporary desks and glass offices and typewriters and broken lampshades. However, the contemporary setting does not distract from the language of the play, in a translation by Don Taylor – the odd ‘terrorist’ creeps in, but as a natural synonym for ‘enemy of the state’. Apparently this translation was made for a BBC production back in the early 1980s, and it’s aged very well indeed. There’s never a moment when the play feels as if it’s being forced to have contemporary relevance; the production allows the power of the original to speak for itself in modern clothes. Eccleston makes an excellent Creon – I had expected a sort of negative version of his Doctor Who, which would have been worth seeing in and of itself, but instead he pulled out acting stops I didn’t know he had to create a convincing picture of a man who’s sure he isn’t really a tyrant while everyone around him is quite sure he is. Jodie Whittaker’s Antigone was also gripping, managing to communicate her passion and single-mindedness with great effect; the scene where she was prepared to be taken to be buried alive was particularly haunting. The chorus are made up of the cast of a political back office – generals, secretaries, administrators – all the people who support Creon’s rule and are thus invested in obeying his judgement rather than speaking truth to power. One of the things I’ve particularly enjoyed about the epic seminar this term is the opportunity to go outside the boundaries of what I normally teach and explore some of the ‘quirky’ epics which don’t always get the attention they deserve. My big discovery this term has been Quintus of Smyrna’s Posthomerica, which I knew nothing about before preparing for the seminars, thus combining teaching and research in pleasing ways. From what we can tell, the poem was written during the late third century A.D. to replace poems of the Homeric Cycle that had been lost, possibly in the destruction of the library of Alexandria. The poem covers events from the end of the Iliad to sort-of the beginning of the Odyssey – the final book reports the great storm which threw the Greek army off course and provided the first impetus for the voyage of Odysseus. I will admit that I approached the text with some trepidation. I am not Homer’s greatest fan; I find the Iliad uninspiring and the Odyssey patchy, so I wasn’t at all sure how I would find a work which deliberately sets out to imitate Homer’s style. I’ll be honest, there were some books which just didn’t grip me – but others were awesome. There is some really interesting, odd material in here, and I do not know why I didn’t meet this text until this late in the game.